Miss J loves projects. She saw a picture a while back of some American Girl guitars so she wanted to make them. This afternoon, we did just that. Took us all of about 15 minutes to produce two simple guitars that she will endlessly enjoy using with her dolls. Color and cut out. You could add glitter or some other glitzy stuff here but Miss J wanted hers just colored. Find a ribbon and tape it on the back at the places where it will hold correctly on the doll – somewhere at the back of the body of the guitar and somewhere close to the end of the neck. Sling it onto the doll and put on some music so she can perform. Simple. That is all there is to it. Enjoy! The birthday party from a while back included another craft activity that allowed for a lot of creativity – turning drums. As I mentioned, the party had a Chinese tea party theme. So, turning drums fit right in. Miss L got the idea from a book she was reading about Ancient China. So, she figured out how to make the turning drums. She asked for paper plates, well saucers really – the smaller ones. She got out sucker sticks and yarn after searching through the stash of craft supplies and finding a variety of wooden beads. She put all of this together with markers and a hole punch and tape in a basket so it was ready for the guests. They came out cute but we had to alter the plan after we had done a couple of them with tape. Instead of taping the sucker stick inside, we realized it needed to be hot glued. The tape just didn’t hold. So, we grabbed the hot glue gun and corrected the issues with the turning drums but gluing the sucker stick and then gluing around the edges. A single hole punch was the tool of choice to create a place on either side to attach the yarn and wood balls to be the beaters of the turning drum. These are what make the sound when you carefully and steadily turn the drum back and forth. This cute craft was a fun one that puts the girls in touch with the history of a culture that is quite unusual when compared to our own. Some of the history of the drums was shared and the girls were proud to take their turning drums home at the end of the party. At a tea party recently, one of the crafts Miss L and her guests made was cherry blossom branches. They were simple, cheap, and loads of fun. They came out simply adorable and can be changed up so simply! 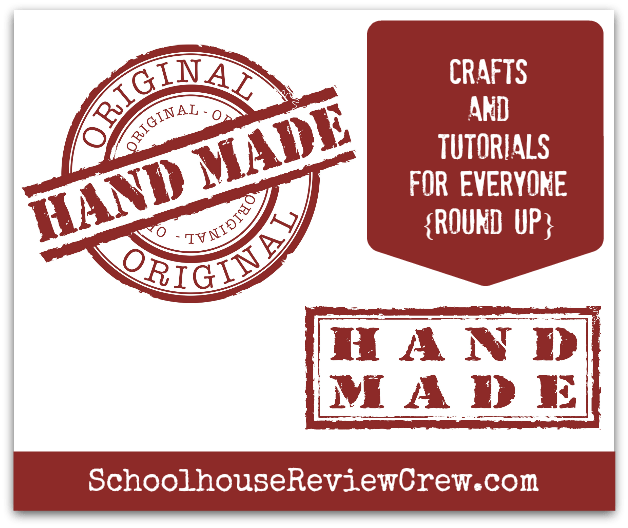 Because of the simplicity of the craft and the fact that Miss E, our middle schooler, really enjoyed making this, I am sharing it for the Middle School Monday post today. 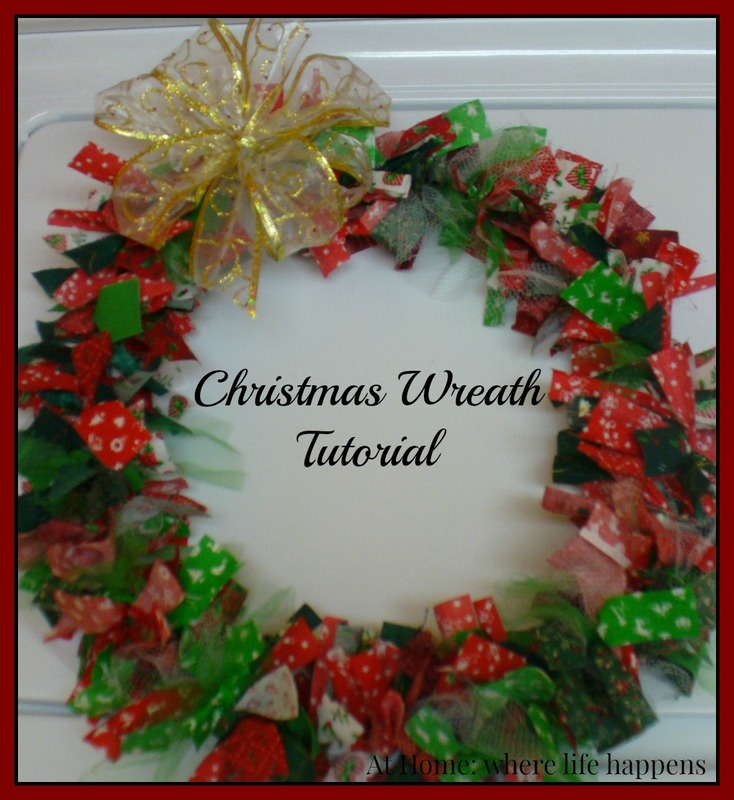 Cut or tear tissue paper into circles of varying sizes. They do not need to be perfect circles; in fact, the less perfect the edges, the more ruffle the petals look and that is beautiful. Stack two or three circles of different sizes on top of each other, biggest on the bottom. Crumble the circles up and then sort of straighten them out again. Gather the center of the circles from the bottom and crunch them up to create a blossom. (That is really hard to describe so I’ll try again.) Fold the circles in half and grab the center. Hold that, open the circles up again, and gather the center into a sort of knot and arrange the edges of the circle like flower petals. Tape that center knot that you are holding. 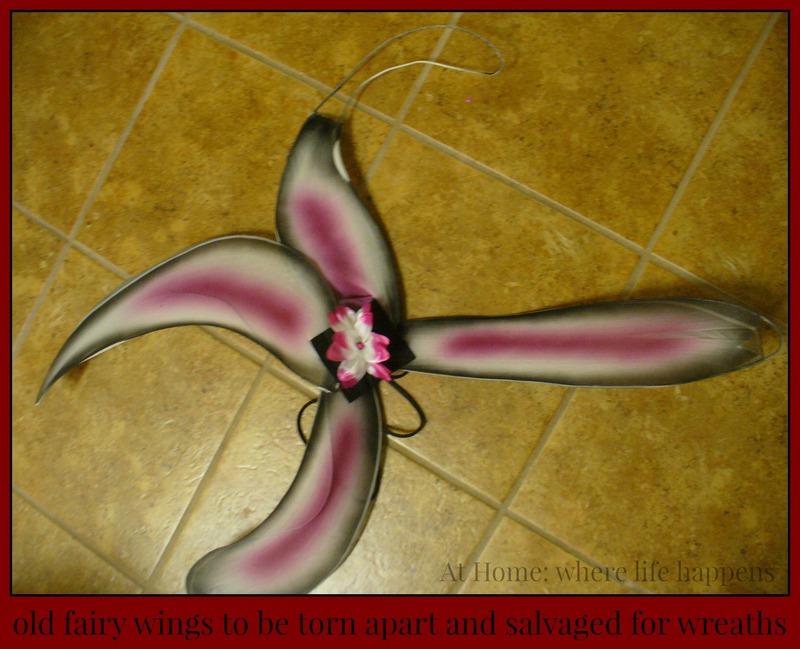 Tape or hot glue the blossom to a branch. That is truly how simple it was to create these. The hardest part is going to be the time required if you want to do a whole bundle of them. We opted for simple and the guests’ came out so interesting a unique. I love to give simple directions and allow freedom of expression. We ended up with quite a variety. The pink ones above were Miss J’s. The following are some of the others that were made. Everyone enjoyed this simple craft. PS – We’ll be sharing more about the tea party coming up. It was lots of fun! It is that time. It is time to color eggs. Oops – nope. Rice. That’s it. We are coloring rice today. After combing the internet and Pinterest for all of about, oh, 5 minutes, I found that most folks used rubbing alcohol and food coloring. There were, however, as many different measurements for these things as blogs you could find doing it. (So we’ll just add one more to the mix…) Here is what we ended up doing. 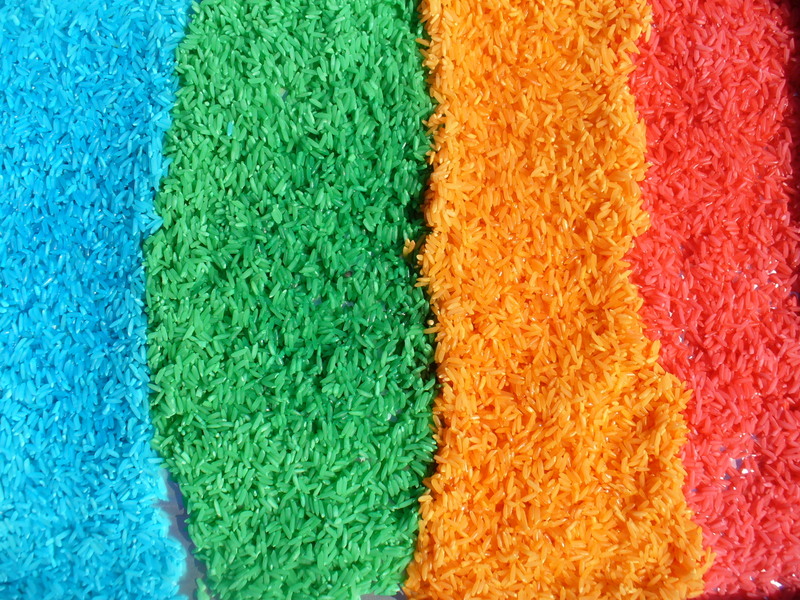 Decide how much rice you are going to make of each color. I did 3/4 cup of rice for each of 4 colors. I decided on this amount based on the container it will be going into after it is dry. Place the rice in the larger bowl. 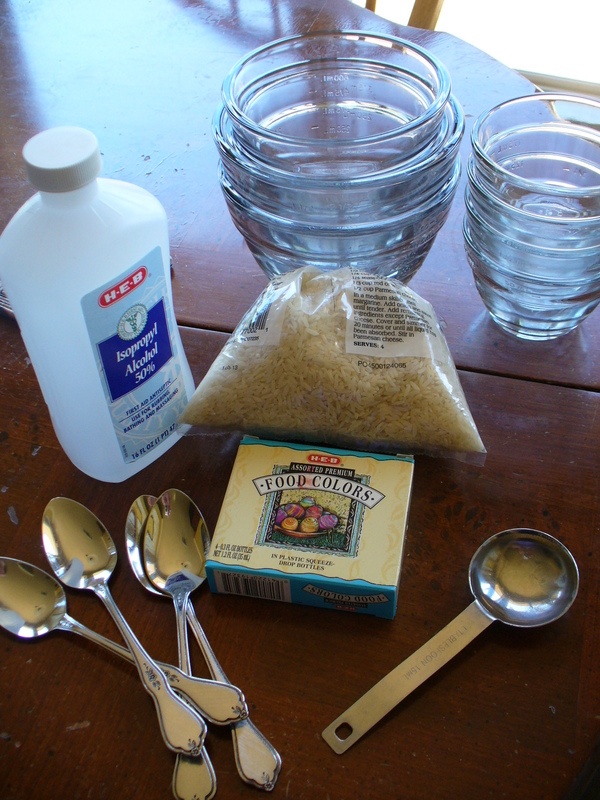 In the smaller bowl for each color, place 2 T of the rubbing alcohol and about 8 drops of food coloring. Stir this up. Add the liquid to the rice in the larger bowl and stir it well. After it is stirred up, evaluate your color. If it is not dark enough, add some more of the food coloring directly to the rice in the bowl and stir again. Do this until you are happy. My oldest decided, after we were into the process, that she didn’t want to make yellow rice after all. 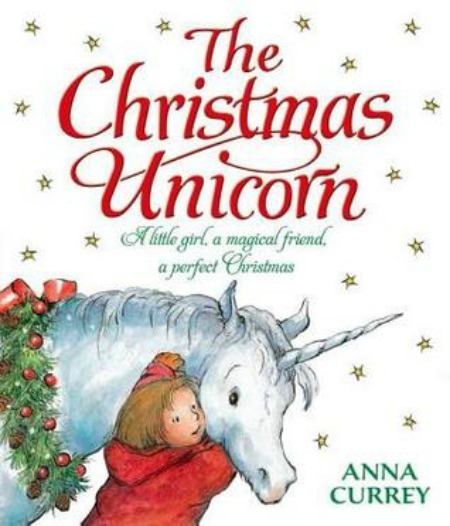 (“Mom, the colors go green and then blue, so we should do red and then orange, not yellow.”) So, she added red to the yellow to make it orange. If doing that, make sure you go one drop at a time and stir well in between so you don’t overdo it and end up with another batch of red. Then, we spread it out in a pan and set it in the sun to dry. Once dry, place it in the contain you are going to store it in or use it in. 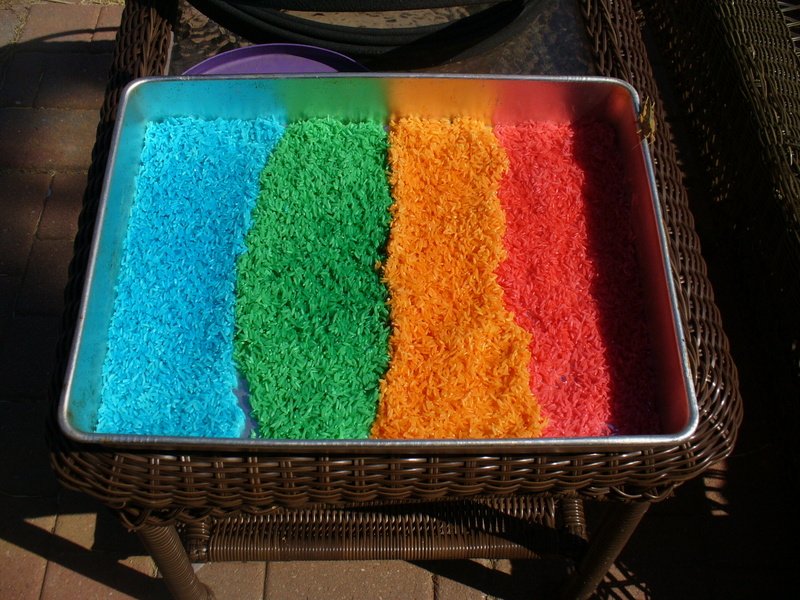 Watch and enjoy as your little ones (and not-so-little ones) have fun playing with the colored rice. At Home. I whipped this up the other night when I was getting some last minute things ready for the first day of school. Having chosen these small cards for Bible memory work, I felt like it needed some kind of a display to create some prominence for it. So, here is a tutorial of what I did. 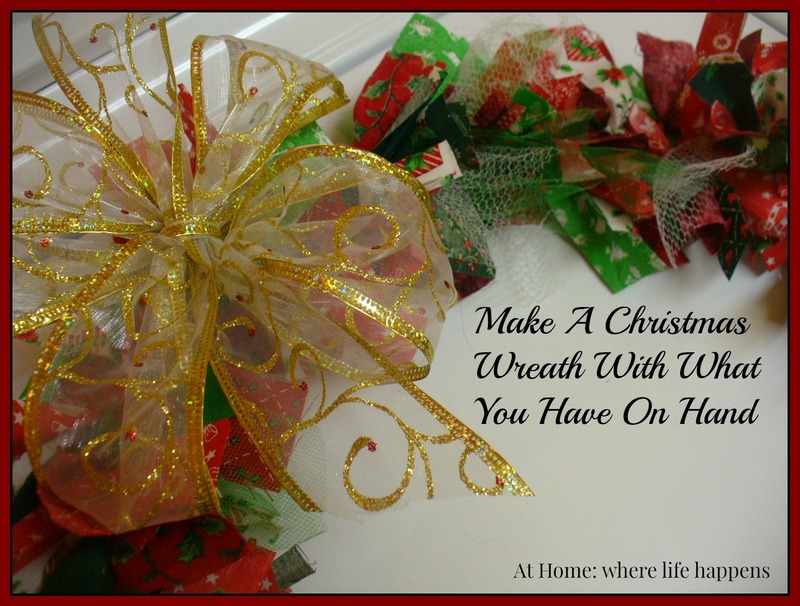 First, heat up your glue gun. 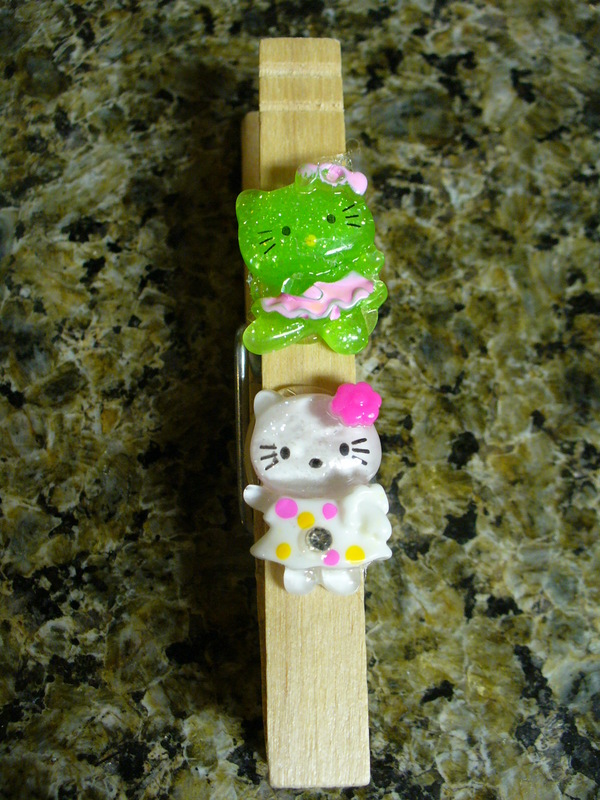 Then glue a decorative button or two onto the clothes pin. Next cut the ribbon or cord to fit across the front of the frame. Determine where it needs to be placed, making sure it is high enough that when your item is clipped on, it is centered (or at least close). 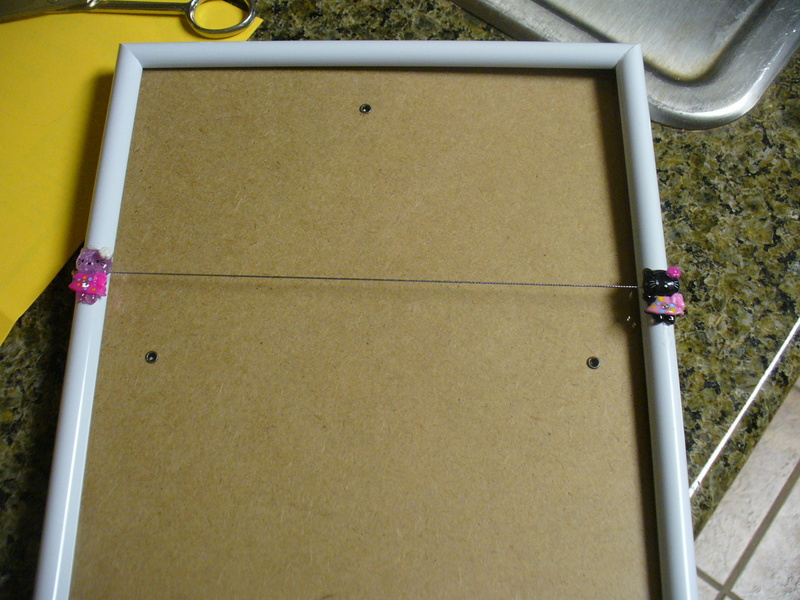 Using the glue gun, place a large dot of hot glue on the side of the frame at that point. 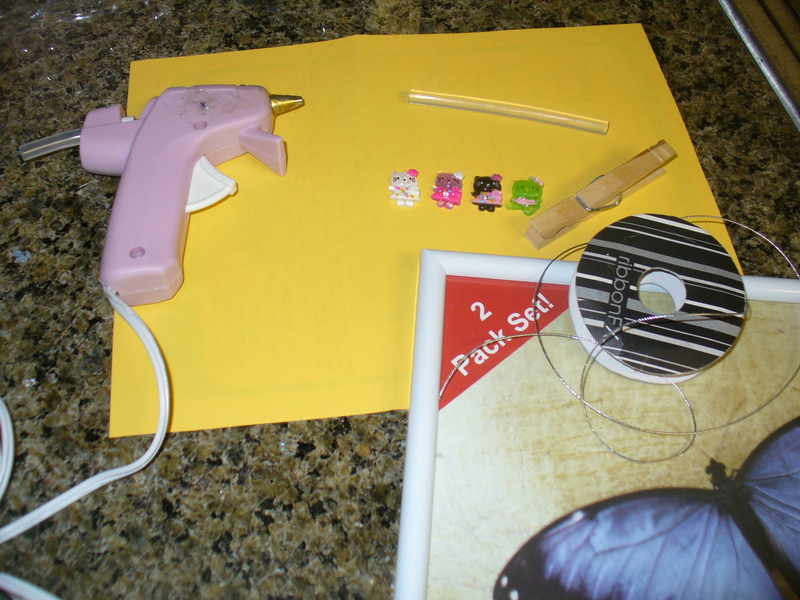 Place one end of the cord in the hot glue and the place a decorative button or bow center over it. Hold in place for a few seconds to make sure the glue sets. 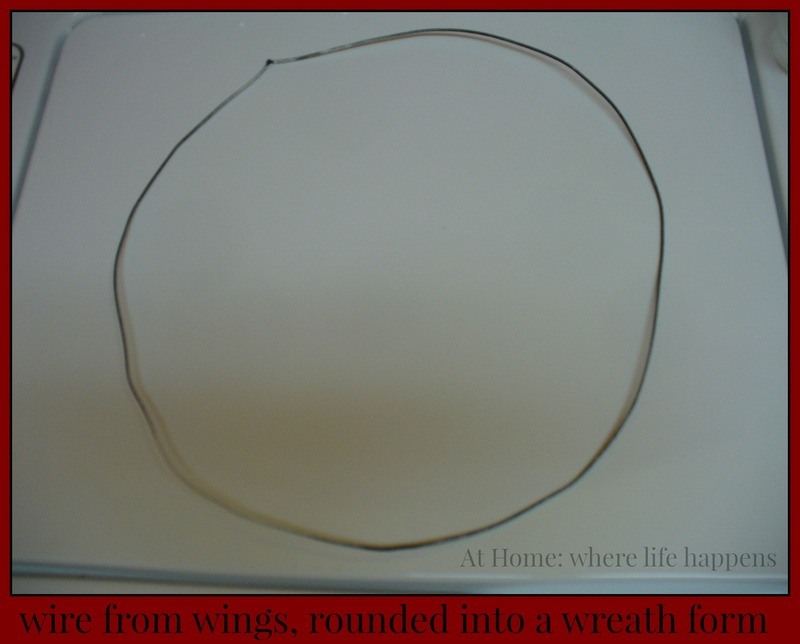 Do the same for the other side, stretching the cord across the front of the frame. 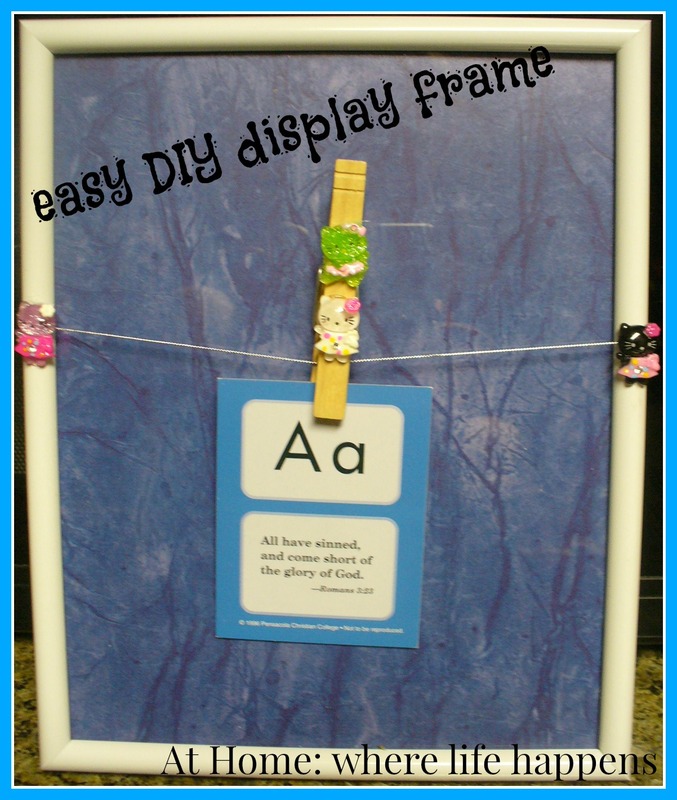 Add the scrapbook paper to the inside of the frame and you are ready to go. All done. 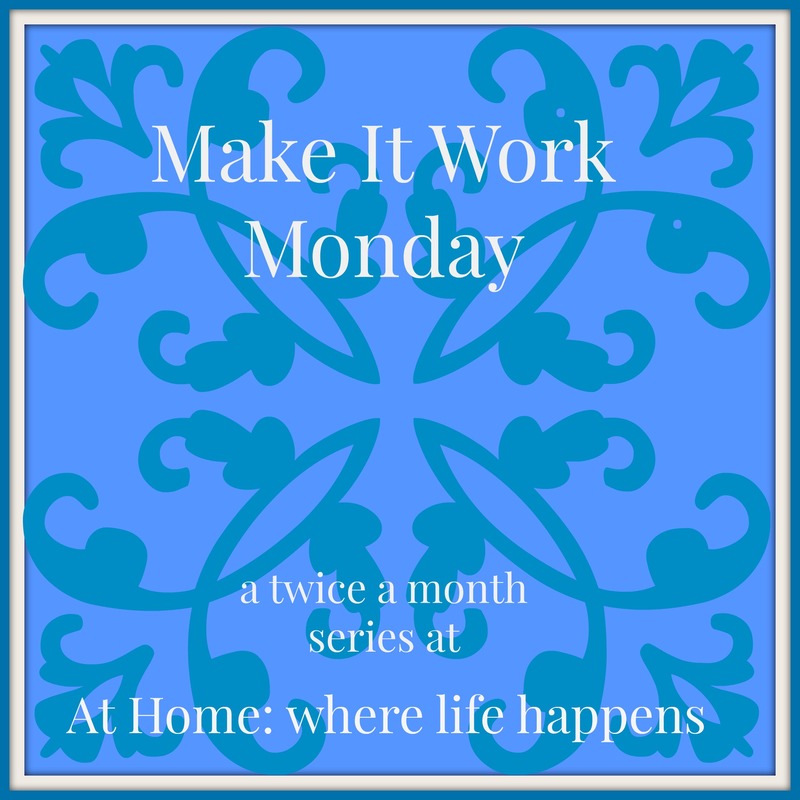 Go hang it up and enjoy! 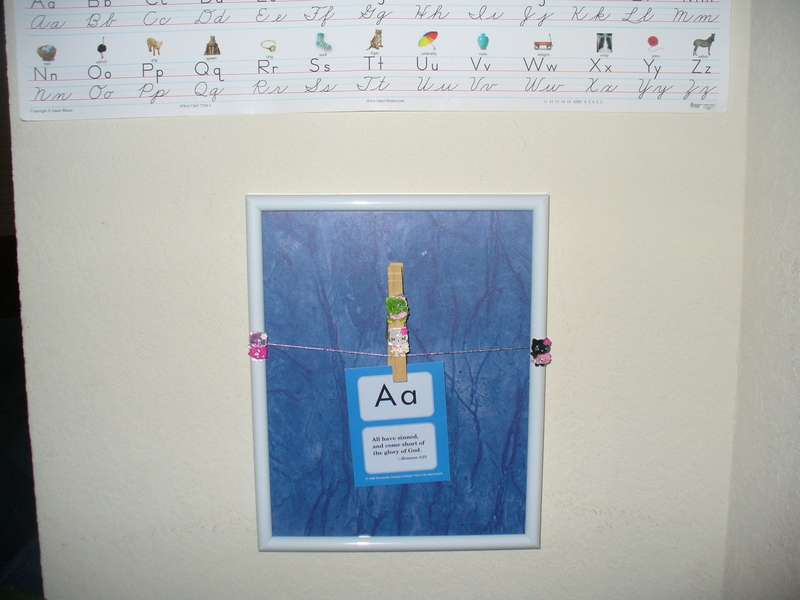 PS – This ended up being a fantastic way and place to display it because E, who is working on her cursive handwriting, pulled a chair up to the area when she was copying the verse onto a white board. She had the words of the verse and the letter formation examples right there together.